All the delegates at the 5th International Rangzen Conference received a group audience and a photo opportunity with the Dalai Lama on the last day of the conference. It was a large group and I was kneeling close by his feet (he was standing) so most probably he didn’t see me. I understand he later asked why I was not there? That afternoon I received a phone call from the Private Office saying his Holiness wanted to see me. “Yes, we certainly did your Holiness.” I replied. He reminisced on this topic for a while and then he said. “I want to talk to you about the Middle Way Policy (Umaylam) I don’t want to argue (tsopa gyapge men). I just want to explain it to you.” He went into a comprehensive explanation of how many world leaders agreed with him and supported his policy and how President Obama had even given him a letter stating that he fully supported Umaylam. He also explained to me how many Chinese from the PRC, especially intellectuals, had now come around to understanding the Umaylam policy and were supportive of it. He rounded off his explanation with this statement that despite the progress of Umaylam, Tibetans must nonetheless continue their efforts to prove that Tibet was an independent nation before 1959. He went on to explain how important it was that we unearth historical evidence of Tibet’s independence and make it known not only to the world but even to the Chinese. He said that without that proof of Tibet’s independence the Umaylam policy would be like a beggar begging for food (pango tho longen). It was up to Tibetans to research and discover conclusive evidence and proof of Tibet’s independence, and publicize it to the world. I interrupted him to explain that this was what Rangzen advocates and activists were tirelessly doing at every possible opportunity. I told him about the portable exhibition “Rangzen Terzod – The Great Knowledge Treasury of Tibetan Independence” (Maps, Treaties, Photographs, Artifacts, passports and documents authenticating Tibet’s Sovereign Independent Status) that members of the Tibetan National Congress (TNC) had set up before the United Nations in New York, to educate passing officials, visitors and others. I also told him about the March 10 Memorial website I had set up with the help of many TNC volunteers, that provided through rare photographs, videos, mini-bios, time-lines, and a dynamic map of Lhasa, a full account of the protest demonstrations, the battles, and escape of the Dalai Lama. I told him about the “Rememberance Wall (pawo-pamo drendhen chakri)” where we had put together many biographies and photographs of all those who had participated in the Uprising. I mentioned in particular the Dalai Lama’s own private secretary of many years, Kungo Tara, who had not only taken over the defense of the Norbulingka Palace, but also attempted to relieve the beleaguered defenders of the Chakpori Mountain. His Holiness became reflective at the mention of Kungo Tara. He then explained to me and to two officials Tsegyam la and another, by the door, that Tara was a very brave and loyal man but also a bit quirky. Tara personally dug a deep trench in the Norbulingka garden and instructed His Holiness on how he was to hide in it when the Chinese artillery barrage started. His Holiness laughed at the recollection. I also told His Holiness that on the “Rememberance Wall” we also had accounts and images of Tsarong Dasang Dadul, Dronyerchenmo Phala, Lobsang Yeshi and other officials who had worked to ensure his safety and his escape from Lhasa. I told him how recently the Tibetan Nation Congress had celebrated in New York City the Centennial of the defeat of Chinese forces in Chamdo in April 29 1918 and the liberation of Eastern Tibet—an event that Khampas remembered as “The New Epoch of the Earth Horse” (kalpa sa-ta lo). His Holiness said that he remembered hearing of this historical event and asked me “Wasn’t you grandfather a general during this war?” Turning to his aides by the door he explained to them that Tethong Dapon was said to have special “enemy subduing” powers. (I don’t recall the exact Tibetan phrase His Holiness used) and that when other generals failed Tethong Dapon was able to defeat the Chinese. His Holiness then remembered the time when after the American withdrawal of support for the resistance we had discussed where we might locate weapons and support. He laughingly mentioned a harebrained scheme I had proposed to buy weapons from Afghanistan (which I honestly don’t recall) and he had a good laugh. But I reminded His Holiness how Gyari Rimpoche and I had managed to get French Intelligence to provide funding for our networks, and how I was sent to Paris by the Private Office. He remembered. He pointed at me at told his aides, “this fellow was our spy there!” He then said “None of these worked out in the end.” No Your Holiness” I admitted “by the end Lhamo Tsering la was arrested, Gyato Wangdu was killed by the Nepalese army and the whole resistance structure had fallen apart. I think we may have talked for over fifty minutes of more, and his Holiness seemed to be enjoying himself. He even ventured into a theory of his, that based on the migration of the earliest humans out of Africa and their movement north to Europe and eastward to Asia, it seemed to him logical that humans had evolved in Tibet first and only later in China, which is further east. 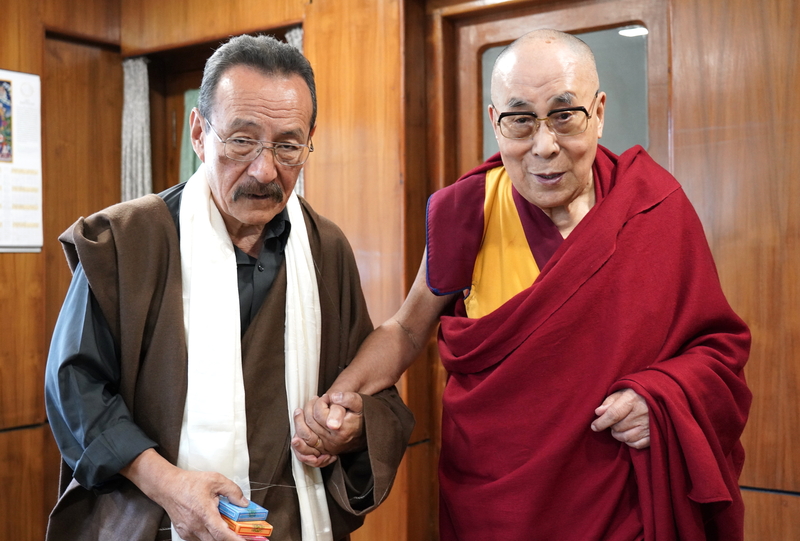 I told him of a recent study I had read in Scientific American that new genomic analyses by Chinese scientists had shown that Tibetans had existed on the plateau in the middle of the last Ice Age, 64,000 years ago, multiplying the earlier figure of 16,000 years as much as fourfold. His Holiness also reflected how even such folk myths on the origins of the Tibetan people, as the story of the Monkey Bodhisattva and the Rock Ogress might have some basis in fact. 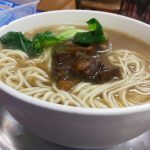 I remembered an article in the journal Nature about a cousin of the Neanderthals, a Paleolithic-era species of the genus Homo, the Denisovans, who had mated with early Tibetans, and conferred on the Tibetan DNA make-up a special gene variant, which gives people of Tibetan ethnicity their unique ability to survive at extreme high altitudes – and I told His Holiness about it. He was even more pleased when I told him that a Tibetan, Dr. Tsewang Tashi was a co-author of one study led by the University of Utah, on this subject. His Holiness tasked me with following up on all such discoveries and letting him know about it. Finally the audience came to an end. His Holiness said “We must take a photograph together. Where’s the photographer” He then rummaged inside the drawer of his desk and gave me a few packets of medicine. “These are “Precious Pills” (rinchen rilbu). These will help you not to become porto before your time. Stay in good health. Before receiving his blessing (chawang), I said that I had a special request for him – that all those struggling for Rangzen would receive his thumon – be in his heart and his prayers. He replied “Of course, most certainly” (yin-ta-yin), you all need not worry (semdrel che go maray). I offered His Holiness my heartfelt thanks and left. Great that you two could meet. Face-to-face meetings are so much more profitable and meaningful than social media chats. Hope you are feeling better. Next time we’ll find time to play a few Bob Dylan songs! Thank you for this beautiful account of your meeting HH. I feel like this might be a beginning of a shift in the our small community. Hope this will lead to a better communication amongst us. And my heartfelt gratitude for remembering past rangzenwas. Feeling great to see you with H H. So pls let me translate this in to Tibetan for Tibetan readers. A very emotional write up! Wish you good health, JN la. You are required by Tibet and Tibetan! Feeling so great to go through your writings and this one means a lot to Rangzenpas….stay strong and healthy as always…. Wow very beautiful Jamyang Rangzen la. Keep it up amd God bless you.Free Tibet.! What a thrilling experience. Thanks for sharing the precious moment. I always believed that Rangzen advocates only compliment the MWA. Very touching and, indeed, a great feeling of jubilance. Its as simple as that. Jamyang la, Tashi Deleg. I am faculty at the Department of Humanities and Social Sciences, IIT Madras am trying to understand and research the process of democratization in exile politics for the past two years. I would be very grateful if I could meet you while you are in India. I am in Delhi for the month of June and request an interview with you at your convenience in Delhi, if possible. Look forward to a reply from you. Thank you! Jamyangla, how marvelous! What greater recognition than this for your lifelong dedication to the cause of Rangzen! Thank You JN la !! Highly appreciate your life long work for the cause of Tibet ! You deserve it more than anyone of us. What a great joy to read! You have been advocating Rangzen entire your life, and I applaud you! Stay strong as always and continue advocate us. Tashi Deleg, and take care! Such a powerful read! Thank you for your lifetime of unrelenting diligence for the Tibetan cause, and for being a true inspiration. Heart-warming meeting, well deserved audience which must send a strong message to entire Tibetans that pursuing Middle Way Approach policy must not constitute negation of Tibet’s past glorious history as an Independent country and that the right to cherish and dream for restoration of Independence shall never cease to pulsate and throb in the heart of every Tibetan national as their birth right ! It is hoped that His Holiness’s act of infinite kindness must have healed the wounds and bruises you have sustained from our people for adamantly fighting and rooting for Rangzen all your life paying huge personal price ! The blessing and comforting words of kindness from His Holiness would not have come at more appropriate time when you are aging and your morale and spirit are at the lowest level as you so bravely stood your ground and continue to wage Rangzen war with almost singular or with fewer supporting hands in today’s changing international political arena. This heavenly audience must have supplied you infinite energy and fully recharged your fighting spirit to carry forward your Rangzen agenda and struggle with doubled determination. power and force in the coming days and will have desired positive impact upon our national freedom movement and shall have definitive beneficial impact on Tibetan national cause both in immediate and in the long time ! The first time I read your article, I cried. It has been a long time coming, for the many many years of your dedication to the cause and for His Holiness to welcome you so openly like the enlightened spirit he is. It does not matter which path one choses, Rangzen or MW. The point is that it must serve the Tibetan nation and its people. I thoroughly enjoyed your writing. How to share this to facebook, plz? Can any one direct me. Thanks! There is no FB logo here to share this across! A thousand words of thanks cann’t be enough for your contribution .. thank you. Thank you.. thank you ..Gen lak .. thank you with deep honor ..
Jamyang Norbu la, what a beautiful and significant moment of your life. Life is reward in itself to those who steadfastly believe in their conviction. I truly salute to your service and monumental work for Tibetan cause. Tibet will never die because you are the best reflection of Tibetan spirit. Your picture with His Holiness has added one more treasure for Tibet. Your Tibetan audio on the meeting with His Holiness is incomplete. Can we hear the complete audio please? Wonderful to know you had this memorable audience with H.H. the Dalai Lama! It is good to know that he understands the struggle of the Rangzen and has blessed you and your fellow Rangzen supporters! Hope this will help encourage others to believe and support this Movement! Bho Gyal lo! Our own double o seven! Who knew! Thank you! The easiest way to share this on fb is to copy the entire URL link above in the search bar and paste on your fb. “ཡིན་ད་ཡིན། སེམས་ཁྲལ་བྱེད་དགོས་མ་རེད།” Very very good news. Congratulations. I remember once you were on a VOA program, telling that the situation was getting worse, but you were looking forward to having such an auspicious audience one day. So, today that day has come to you. You have proven your prophecy and you have realised your dream. I have read your blog post with keen interest and also played the audio recordings! I am extremely touched by the free and frank conversation that transpired between His Holiness and you. Both His Holiness and you have recalled and shared some highly important information that could be considered confidential classified notes. I was an elected General Secretary of RTYC Leh early 90’s and stood for Rangzen. I worked for Rangzen then. Later I settled in Dharamsala and opted for Umaylam. Now after reading it I’ve decided to support both R&U! Best of luck JN! May you be healthy and live long for a United Tibet and Tibetans. Thank you for sharing it. Tashi Delek Jamyang la! its like དུས་ཐོག་གི་འཆར་པ་ This occurred at the right time, when our society is not as united as it used to be. Keep doing what you’re doing and do also keep in touch with His Holiness. We, as a nation, must look to see what is best for our country and people. I am overjoyed to read this. Congratulations JN! To keep the fact of Tibetan Independence in the past alive, fresh forever in our memories is very important, in whatever situation we live in the future. Along with the memory of past history, it is practically important to learn, practice and promote Tibetan Language, literature and Buddhist way of life which, I believe, are the sustenance for Tibetaness of Tibetans as separate from any other nation. Encourage others to keep Tibetan tradition alive for generations. Thanks for sharing your experience of exceptional audience of His Holiness. Very happy for Jamyang Norbula. He deserve this and hope this re-energizes him. Jamyang Norbula, Lhasang Tseringla and Tenzin Tsundue la are the the steadfast supporters of Rangzen. Nothing against Umaylam. I respect their stand too. Those interested in the Denisovan-Tibetan story may go to How Tibetans Survive Life on the ‘Roof of the World’, bbc.com, February 27, 2017. Be assured, it is an interesting read. An extinct hominid from the Altai mountains may be the Pha Teu or Ma Draksinmo of our ancient lore. Isn’t life full of ironies? JN experienced difficulty in getting an audience with H.H. during the bygone years. Now visiting Dharamshala from the remote Smoky Mountains of Tennessee, JN-la is blessed with an audience out of the blue, invigorating a moment of sentimental lollapalooza. It was really touching read and thank you so much for sharing. I am so very happy to learn and see that His Holiness had literally asked for you and gave a private audience which I had been longing for over a decade now. It brought me tears that you have asked His Holiness (Kyabchu thumon) to pray for all Rangzen activist. I would like to thank you for all you have done and will do for the cause and pray for your good health. Jamyang Norbu la, Tashi Delek. I’m a great admirer of you. Perhaps you don’t know me, but I am honored to have on a number of occasions to join your table in hotel Tibet, may be in early 90s. I’m a Umay-lam supporter, but I think, your meeting with HIs Holiness and the discussions you had with him have presented to the general Tibetan public that you are a living asset for our cause. I’m very happy for you about this life-changing meeting. I’m sorry but I need to know why my comment is taken off. I was being moved by His Holiness Middle Path idea since 1990 when I decided to leave TYC membership but I liked Jamyang la sharing his most recent experience. Discussion about past reminiscence and searching more evidence of independent Tibet were valuable gift for this audience. Thanks for sharing and wish you able to bring concrete facts in future. Your Legacy will stay in our heart forever! You have always been passionate about the Tibetan cause and I can understand His Holiness emphasising Middle Way Policy; you have always maintained a tough posture when it came to dealing with Chinese related issues. 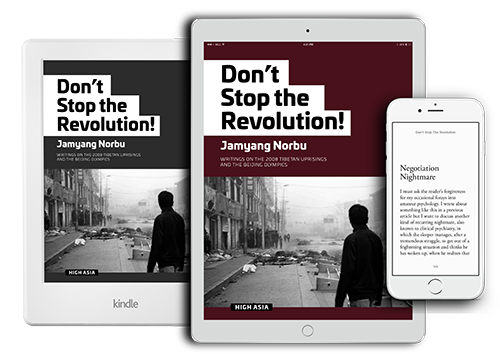 We have found your writings full of insight and evocative; making us understand matters concerning Tibet and Tibetans in proper perspective. Your discussion with His Holiness brings out the important role that you have played and continue to hold sway being in the forefront of Rangzen. We get the impression Rangzen is a vibrant organisation and we do hope its activities would go a long way in furthering the cause of Tibet. We may not attain complete freedom but at least the Tibet issue will remain alive and that the world will get to understand Tibet’s past history in true light. It is evident that His Holiness has the confidence in you and that you can play a crucial role in this direction. We know you will deliver – real loud and clear. The meeting of HH Dalai Lama with the Rangzen Activists and subsequent audience granted to Jamyang NorbuLa is by far one of the most important and inspiring moment for many of us supporting the right of Tibet to regain her Independence. It is also important for all Tibetans in fact, because in one moment, and during one meeting and one photo, it dispels decades of ostracism, criticisms, and harsh judgments that Rangzenpa where given. It is the power of one photography, showing Tibet most beloved Leader with one of Tibet’s most knowledgeable person, which gives so much hope and renewed energy to all of us. HH and JN meeting is not only important as such, because both are passionately working for Tibet’s future, but because it paves the way to a much needed and crucial necessity to a reconciliation between MWA and Rangzen followers. By His act, HH shows that NO Tibetan is out of His sphere of Love and Compassion, He shows His sincere and practical will to implement Democracy within Tibetan Politics. That is not to say that from tomorrow both tenants of Ways will hug and work together, but at least hope is now present that they will not work against each other. From now, no one will dare, unless foolishly feeling superior to HH, to ostracize and condemn without mercy Rangzenpa to hell. HH knows that future Fight for Freedom is now entering its most difficult period, with China dictatorship more powerful than ever, He knows that Tibetan Unity is crucial and prerequisite to any possible future for Tibet as a separate entity, whether Autonomous or Independent. Asking JN to record and gather proofs of Tibet Independence is primordial, not only to give a legal basis for demand of Autonomy, but also to keep open the legal historical right-and possibility-for a future Independent Tibet. My personal view is that MiddleWay is a WAY, and Rangzen a GOAL. To consider a way as a goal was in my view a mistake, but present critical conditions in Tibet-which will deteriorate further-demanded probably such a concession, the only problem is that Tibetans don’t face British India, like Indians did before their independence, but the most ruthless and scruples denied corrupt regime, the Nazi China dictatorship. Therefore my view is it is supremely important and relevant to keep and publicize proofs of Tibetan Independence, as requested His Holiness, but, going further, subsequently demand SELF-DETERMINATION for Tibetan People. Self-determination is the common ground on which ALL tibetans can reunite while fighting for the Historical Rights of Tibet Fatherland. Self-determination cannot but being unanimously accepted by all, both Rangzen and MWA tenants, being a basic Right of a People, it is been listed by International Instances (UN Resolution) as Tibetan inalienable Right. No other Country can legally or politically deny this Right to Tibetan People, therefore binding them to support Tibetan Cause. 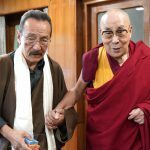 In conclusion, I would like to thank Jamyang NorbuLa for his immense contribution to Tibetan Cause, often at personal cost, and for making us proud of Tibetan People, thank him for this photo-requested by His Holiness! who make us happy and full of hope. Tephun and Namgyal says it all? The last paragraph brought tears in my eyes. So proud of this moment. Congratulations Jamyang la. What a great news. Thank you for taking the time to writing such a thought provoking and elaborate comment. Right to Self-determination- this surely sounds like a common rallying point for every Tibetan. Felt nice reading this article… thank you Genla. You are amazing. Absolutely good to know that you had private audience with His Holiness, It’s gives more pleasure to know that you had good discussion with his holiness. Wish you to have good health and don’t get (PORTO) old, Tibet and Tibetan people needs you. Gen la you well deserve this. I don’t think anyone could have said it better. 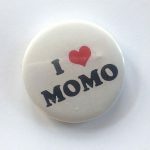 Normally, I am not a pessimist but under the circumstance, I doubt the current MWA will acknowledge this very important message from His Holiness or will they accept, if not collaboration, co-existence with Rangzen supporters. The radical pro-China lobby among Tibetans is stronger and using His Holiness’s name will arm-twist most of the populace. Jamyang Norbula – you could not have asked & received a better Gift. You deserve All this (latent) felicitation finally. What a great moment for the unity of the Tibetan people. It was a long time coming and I am glad it actually happened, especially at the end of the Rangzen Conference. Auspicious. We all know how much love and respect you have for His Holiness in private conversations but it is always nice to see it manifested in public. Many Thanks for getting His Holliness’ blessing on Rangzen as an option. His steadfast adherence to his ideals has endeared him to countless patriots. His Holiness in his prescience has blessed him and told him to carry on with his work. This alone, no doubt, vindicates his decades long struggle to keep alight the torch of Rangzen. I was moved reading this article. This most probably is the beginning of a new era among the tibetan diaspora. Thanks to both for meeting each other and to Jamiang for sharing the conversation. I am an Indian aspiring to do my doctoral thesis on three Tibetan diasporic novels. I want to start with your famous novel “The Mandala of Sherlock Holmes”. While I started to read your novel I found three voices in your novel.One is of a western viewpoint that of Sherlock Holmes,other is of Huree Chandra,an Indian and the third one is of omniscient narrator’s that is of you to be very specific.What according to you are the diasporic elements in this novel? I have found that the great detective viewed Tibet as Shangri-La and the Indian( Hurree Chandra Mukherjee) had a trans-cultural complicated view of Tibet.What is your message that you wanted to portray in this novel.Looking forward to your valuable reply.It would be of immense help in developing my thoughts in order to substantiate my thesis. Sorry for getting the quote from Theodore Parker, nineteenth century American pastor and abolitionist, bit skewed in my last post. It should be, “the arc of the moral universe is long, but it bends toward justice”. I think this is a discreet consolation to the nationalists who are logically follow altruism of Tibet’s independence by a small percentage of Tibetans embrace without fear and with reason for 6 millions in Tibet. Our majestic fight is dwindled by our own leader and his sycophants. Wishes for your good health! Jamyang la. I am so happy for you. This face-to-face meeting with His Holiness the Dalai Lama itself ihas been a History in the making. It should shed nagging doubt in many who think you are anti-Dalai Lama. I have always admired your immutable stand for RANZEN and declared you are not an anti-Dalai Lama. This audience is one of the many proofs. Tibetan Rangzen history will cherish you for ever. Your great father Kungo Lhawang has also been instrumental in providing modern education to thousands of Tibetan refugee children like me. People seem to forget this too. What a great shame that even CST Kalimpong has failed to mention Kungo Lhawang la during it’s 50th anniversary. This is the kind of our people’s political foresight and wisdom. By the way, for me, “If it is something achievable, I want both Lam Uma and Rangzen. However, if either is not achievable, even than, I want both Lam Uma and Rangzen.” At any cost, Tibet’s issue and Tibetan people’s political aspiration must not become a Guru Devotion business. Let us all think seriously speaking! Seeking Tibetan National Aspiration is not same as seeking Nirvana and Buddhahood in Dharma. If we truly want our political aspirations to be fulfilled than We Tibetans must not forget our true history and learn to understand and know the truth about China then, now and future. This is truly encouraging experience. First time I am seeing 100% positive comments and view on this blog. Vast majority of readers are deeply touched by this historical moment. I hate Umaylaam people. They are always nagging and making life miserable for rangzen-wallas. Not fair at all. A member of parliament, and a prominant MP, Sharchok Khutta went so far as to wield Chinese national flag in the guise of umaylaam promotion. Now, more and more umaylaam people are switching to rangzenwalla’s camp. I can’t wait for horrible umaylaam people to face a crushing defeat when Prof Lukar Jam wins 2021 sikyong election. Each Tibetan family in diaspora will send one boy for Tibetan Freedom Army which will fight to overthrow CCP using military tactics advised by all-seeing Nechung Oracle. Thank you for a very enlightening read, at once inspiring and setting into relief a perspective on the Tibetans’ rightful fight for their homeland. My interests are academic, though. Yet, academics is a platform for far-reaching and long-lasting changes in the world. The internet is so full of websites and activities that it is sometimes difficult to regard something that can be academically used as references. That is why I am glad that I found your blog for a steadying and continued reading and understanding of the Tibetan claim for the motherland.I shall also begin to read your books to understand the different facets of the Tibetan struggle in the diaspora. I will certainly be happy to receive any suggestion from your end. Congratulation JN. I always know at heart you have a strong bonding with His Holiness and I am very much touched by your private interaction with His Holiness and thank you for sharing it with everyone. Great article only JN can write. Thank you. Dear Jamyang la, I personally do not agree with your position on the future of Tibetan people’s relationship vis-a-vis PRC. However, I have always wanted brave warriors like you and Lhasang Tsering who did nothing but stood for Tibet’s historical right to be respected and appreciated by the Tibetans. At this juncture where unfounded arrogance and confidence have turned Umaylam leaders increasingly vindictive, His Holiness’ kind gesture comes as the right antidote to counter the poisons being spread in his name. I am glad that you are being appreciated and your place in the history of Tibetan people’s struggle is being acknowledged by none other than our beloved Kundun. Please continue on with your steadfast, uncompromising fight for Tibet and her people. Jamyang Norbu la, there was talk of Radio Free Asia banning you and your show from broadcasting. And this guy from Newyork, has issued a threat to Free Asia. Did you know what is the truth, have you investigated on that. Why cant you write one something that wants to silence you.